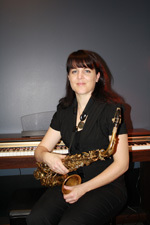 Mary-Sue Tobin received a Masters of Music in Saxophone Performance and a Bachelor of Music in Jazz Studies from Portland State University where she served as the graduate teaching assistant for the jazz studies department. She has played and studied with many of the Portland jazz luminaries (including: Glen Moore, Darrell Grant, Thara Memory, Alan Jones, Rob Scheps and many others) in addition to leading her own groups. Current performing ensembles include: Andrew Oliver Sextet, Portland Jazz Orchestra, Soul Vaccination, Art Abrams Swing Machine, Paxselin Quartet, Lily Wilde Orchestra, Portland Jazz Composers’ Ensemble, Quadraphonnes, PDX Saxophone Quartet and The Groove. She also appears on recent recordings with many of these groups. She performs regularly with The Oregon Symphony Pops (Pointer Sisters, Johnny Mathis) and has performed at numerous Jazz Festivals (including The Portland Jazz Festival, The Mount Hood Jazz Festival, Cathedral park Jazz Festival The Vancouver Wine and Cheese Jazz Festival, The Banff International Jazz Festival) and has shared the stage with international jazz and R&B stars such as Dave Douglas, The Temptations, James Moody and Esperanza Spalding. She appears in the movie "Hear No Evil" with the group Dub Squad and has toured internationally with the groups Flatland and Dub Squad, opening up for legends like Herbie Hancock, Steel Pulse and Third World. She has recorded and performed with numerous regional and international artists and continues to lead her own projects when time allows. Mary Sue is proud to announce that she is currently endorsed by Cannonball Musical Instruments. Mary Sue Tobin maintains a full studio of students through the Beacock Music Education Center where she also directs band and teaches jazz improvisation seminars. She also serves as an adjudicator for NW Solo/Ensemble festivals and a clinician for school seminars. She has performed classical concerts with her saxophone quartets multiple times at the North American Saxophone Alliance Conference and also performs with the Portland Center Stage Orchestra for their musical productions. She and her family live in Portland, OR where she teaches, records and performs professionally. If you have a question for Mary Sue, or wish to contact her, please fill out the form below. The message will be passed along to the Education Center and they will get back to you.